DESCRIPTION : Step 3. - Dr Arty Artman's 7 Step Guide to illustrator Success! Always wanted to be a famous artist? Need to fatten up that illustration folio? Or just need a bigger thumb! Here's the answer to all your woes. 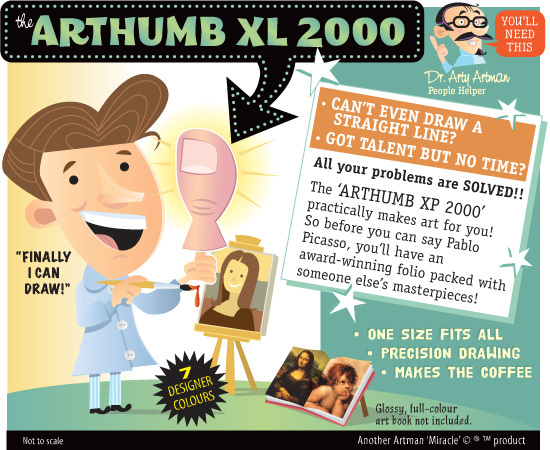 Being an illustrator, painter, sculptor or hitch-hiker has never been easier with Dr Arty Artman's 'ARTHUMB XL 2000'. Just slip it on and let this 'Miracle' product do the all the hard yards.